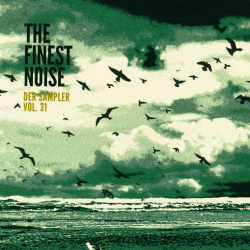 About twice a year, The Finest Noise offers a compilation featuring bands from the most different genres. The artists are usually not even signed to the label but get an opportunity to present themselves to a larger audience. The opener doesn’t make life easy for the reviewer. Toc.Sin perform a nearly eight minute long track that would have been labelled trip hop fifteen years ago. The song is very atmospheric and the female vocalist has a charismatic voice, but somehow the song doesn’t stand the test of time. Rock band A Guy Named Z isn’t that spectacular either, but Twist Of Fate finally get my attention with their vital rock sound. Next up things get more interesting for the metalheads. In This Temple are acting rather coarsely, unlike Arhythmy who show more tact with their intriguing mix of black metal and post rock. Mantrum play solid death metal, and Solaced offer their metal with an avantgarde touch. More extreme stuff comes from Home Reared Meat who combine their death metal with grindcore. Hard rock fans should check out Roadrage. Not metal, but definitely interesting is experimental band Arktis/Air from Vienna who count King Crimson among their influences. Retro rockers Ashbury Park also happen to please with their psychedelic infused sound. There are also quite a lot of bands featured that are not hitting my taste buds. Zlang Zlut play Southern rock, which is absolutely not my thing. Ben’Tagon’s mix of pop and rock is definitely too tame. The compilation’s weakest artists are Klaasius with their Mannheim sound and Jaana Redflower who is certainly not the most gifted Janis Joplin double. Auftrieb’s diskurs pop has nice moments but can’t convince fully either. Taelus indie pop is definitely better. The last two tracks are a not very interesting cover version by Audiogramm of Der Mann mit dem Koks, and the M. Ward clones Zoetrop. No one will like every band featured on this compilation, that much is sure. The artists are just too different from one another to make this a pleasant listening experience. Most bands sell the compilation for about 5 Euros, and the label gives it even away for free, provided you pay shipping and handling. But the question remains: in this time and age, wouldn’t a digital compilation or even a Spotify playlist be a more adequate way to reach your audience?